I absolutely love making soup. It’s cozy, it’s healthy, and the main reason -- it's just so easy! There’s something so beautifully grounding about sitting down after a busy day, holding a warm bowl of yummy food in your hands and eating it slowly. It’s like flipping a switch and coming back to the present moment. When I made this soup, I noticed I closed my eyes every time I took a spoonful. I don’t think any other food does that to me! No, chocolate also does this to me. Soups and chocolates: the eat-with-your-eyes-closed delicacies. 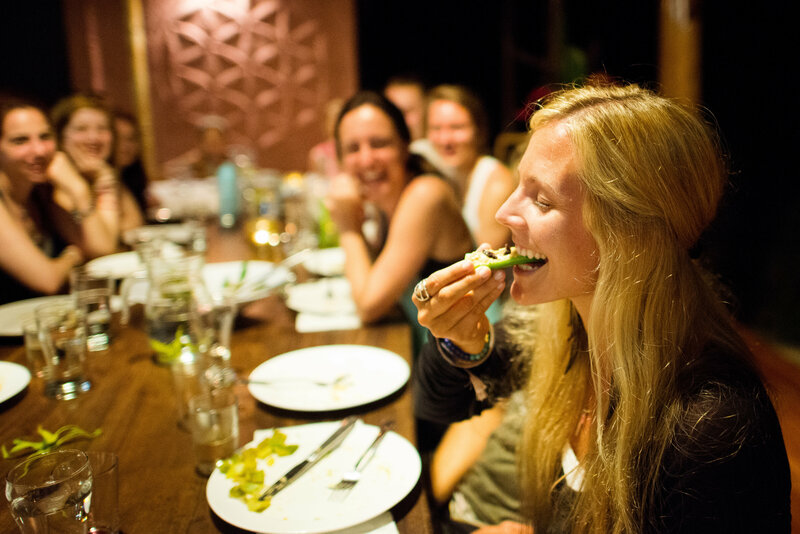 Speaking of eating with your eyes closed… Do you eat mindfully? Or are your eyes glued to a screen as you chew? Ayurveda talks a lot about mindful eating and how the way we eat matters so much more than what we eat! Pausing before taking the first bite, giving thanks, and then noticing every flavor and sensation as you chew all help your digestive system process your food better and absorb more nutrients. Ayurveda also mentions the effects that what we watch have on our digestive system. If you’re watching a thriller while eating dinner, for example, your body is going to be responding to the movie with its fight-flight-freeze systems and the nutrients in the foods won’t be nearly as absorbed or properly processed! What we focus our attention on, what we eat, how we eat… It is all so connected. You can be busy and still be mindful. The world will keep spinning if you turn off your phone to enjoy a meal, promise! What if you tried it? Couple eating a nutritious, yummy meal with practicing mindfulness... Can you imagine how happy your body and mind will be? Give it a try with this quick and easy recipe! This is one of my favorite soup creations I’ve ever made. It’s filling, nurturing, easy to make and absolutely delicious. Feel free to mix it up with different kinds of mushrooms (why not chanterelles if you have some in season?). The taste will differ depending on the variety of mushrooms you use. And it’s anti-inflammatory and antibacterial. There isn’t much this soup can’t do for that beautiful body of yours! Chop the onion roughly and put in a wide-bottomed pot with a big dash of olive oil. Let the onion sweat for a bit, then add the rosemary and stir. While the onion is browning, clean and slice the mushrooms and chop the garlic finely. When the onion is golden, add the mushrooms and the garlic. Sauté until the mushrooms are fully cooked and have sweated out any liquid (a couple of minutes). 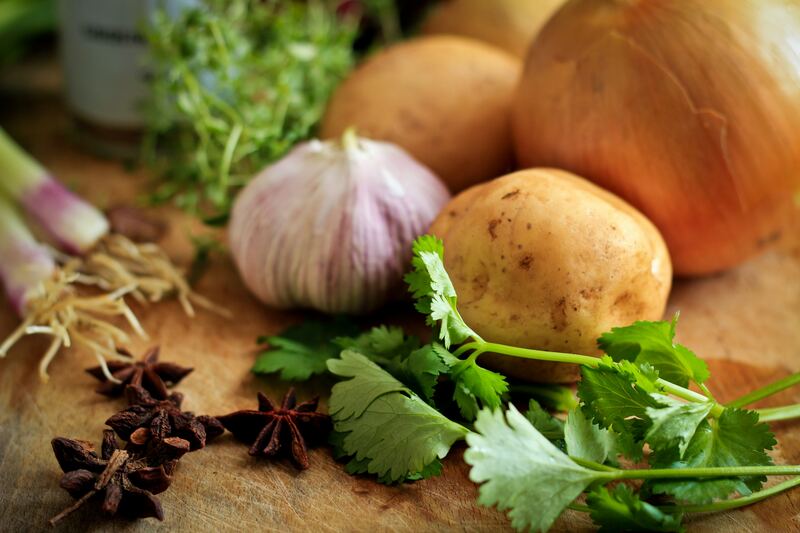 Chop the potatoes in even sizes, then throw them in the pot and cover the whole thing with vegetable stock. Lower the heat and let it all simmer until the potatoes are soft (10-15 minutes or more). Add more stock as you go, if needed. Turn off the heat and use a hand blender to blend everything together (or transfer it all to a blender, that works too!). Once the soup is smooth, add half a can of coconut milk. If the soup feels too thick, add a little bit more vegetable stock. Bring it to a simmer again, then add the liquid aminos (or soy sauce) and season to taste. Garnish with fresh chives and enjoy immediately! I eat my soup with a big chunk of garlic bread (like all soup should be eaten), but enjoy however you please. Just remember to give your meal your full attention, gratitude and love. Let me know how yours turns out, and your experience with mindful eating, in the comments below! More cozy recipes can be found on oneOeight.com.